Bukayo Recipe is a Filipino dessert made from shredded young coconut meat and cooked into caramelized buko juice and brown sugar. 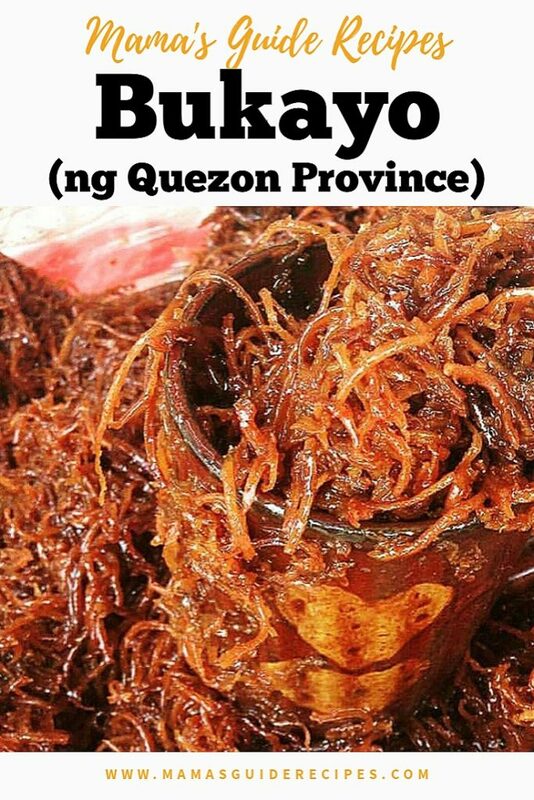 This favorite dessert in Quezon province can also be used as a filling to different Filipino kakanin and or as a toppings to any dessert. Happy cooking! In a large pot, add young coconut juice and bring it to a boil together with sugar and pandan leaves. Keep stirring until the sugar is dissolved. Let it cook over medium heat until the mixture becomes thick. Carefully remove pandan leaves and add vanilla extract. Stir thoroughly. Set aside. In another pan, heat oil and add the shredded coconut meat. Stir fry until it turns light brown but do not toast to much. Drain oil and turn off heat. Make a slurry: In small bowl, add cornstarch with a tablespoon of water and dissolve it. Add the slurry into the cooked shredded coconut meat and mix it well. Over medium to low heat, add shredded coconut into the coconut juice-sugar mixture. cook it and blend well until it becomes caramelized. Transfer the cooked bukayo into a large bowl and divide it into serving sizes. You can scoop it in little balls and use a wilted banana liners to serve. You can also use Bukayo as a filling for different Filipino kakanin like cassava, puto bao and pan de coco bread. Happy cooking and enjoy!